The Rev. Noel Joyce Knelange was the first woman to be ordained a priest in the Diocese of Oregon. This took place on May 20, 1982 at the Church of the Good Samaritan, Corvallis with the Rt. Rev. Rustin R. Kimsey, Bishop of Eastern Oregon officiating with permission from Bishop Matthew Bigliardi. According to Noel, her spiritual journey started with a Billy Graham crusade in San Diego, California. She had lived most of her childhood in La Mesa, California, graduated from Helix High School in 1962, and went on to get her BA degree at California Western University. It was at this time she had a conversion experience at a Billy Graham crusade. She states that she was quietly enjoying the service until there was an altar call and she found herself drawn to make her commitment to Jesus Christ. She was suddenly aware of herself in front of the altar not remembering how she got there. Noel was drawn to the liturgy of the Episcopal Church and joined St. Andrew’s, in La Mesa. Noel received a Master’s degree at Seabury Western Theological Seminary in Evanston, IL in May of 1968. From there she returned to her home state of California where she was ordained according the form and manner of Making Deaconess on November 10, 1968. Bishop Rusack of the Diocese of Los Angeles officiated at her sponsoring church of St. Andrew’s. Noel served in a number of parishes and ministries as a deaconess. 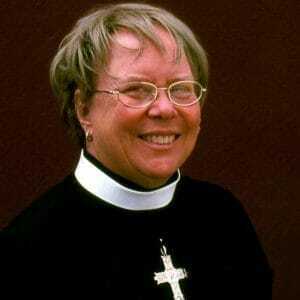 From 1970 to 1971 she served in her sponsoring parish and then left to go to Medford, Oregon where she served as a deaconess at St. Mark’s Episcopal Church. Later in 1971 she became an assistant at Trinity. In 1973 Noel answered a call and moved to Corvallis and the Church of the Good Samaritan where she also served as chaplain at Good Samaritan Hospital until 1979. In 1980 she answered a call at St. Barnabas, Portland where she served as a deaconess until 1981. At that time she was inducted as a deacon at St. Hilda’s, Monmouth until her ordination to the priesthood in 1982. Noel served the parish of St. Hilda’s as their vicar until her retirement. Noel’s ordination to the sacred order of priests on May 20, 1982 was another milestone in the struggle for women to be accepted in this ministry. This did not come easily for Noel. Though General Convention began allowing the ordination of women priests in January 1977, the opposition of the all-male membership of various diocesan committees delayed ordination in the Diocese of Oregon. The Standing Committee turned her down once and she “questioned whether it was God’s way of saying ‘no’.” Through meditation and prayer she came to understand that it was only a stepping stone on the way. Noel’s term of service at St. Hilda’s was productive and inspirational. Through her ministry the parish raised up three priests as well as two deacons, and she opened the door for many more women deacons and priests in the diocese.